Before her diagnosis, 30-year-old Kelly Owchar‘s life looked pretty much perfect from the outside. 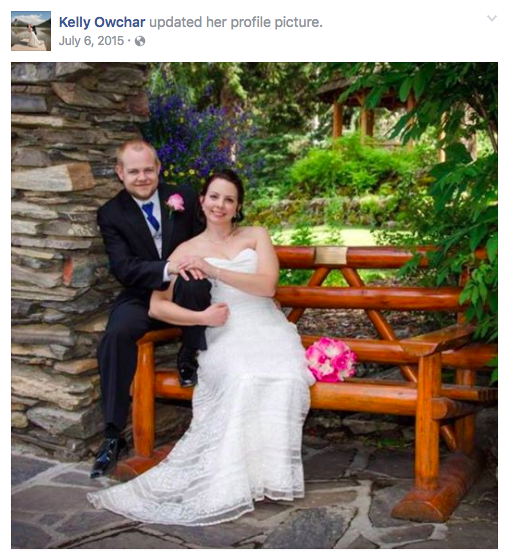 The Canadian nurse was approaching her four-year wedding anniversary with her husband, Dwayne Owchar. The couple had a two-year-old son, Eric, and Kelly had just given birth to twin girls, Leah and Lauren. But things weren’t exactly what they seemed. After her twins’ birth, Kelly experienced postpartum depression, stomach pains, and extreme fatigue, all of which contributed to her inability to keep up with the needs of her three children. She was understandably concerned but also thought she was just in the middle of an adjustment period; she believed everything would work out on its own. Then, two weeks after the girls were born, Kelly noticed a lump in her left breast, which she initially thought was a blocked milk duct. As a nurse, she knew to massage it while nursing and use warm compresses to help the blockage break down, all the while looking out for signs that the area may be infected. But no such symptoms showed up, and there was no pain in the area. Friends and family reassured her that everything was fine, but, as she wrote in her blog, she felt that something wasn’t quite right, that the issue wasn’t just a normal part of being a new mom. 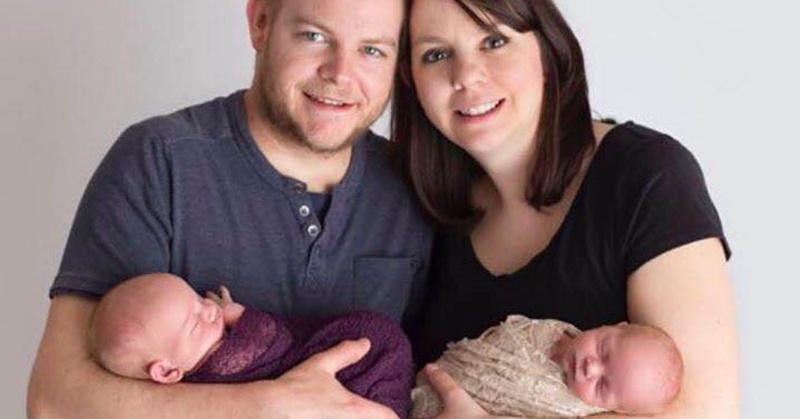 When Kelly finally decided to see a doctor about the obstructed milk duct, she was distracted from receiving the results of her tests by a respiratory infection that landed baby Leah in the hospital. Kelly finally got her diagnosis on Monday, May 15th, 2017. She had stage IV invasive distal breast cancer that had spread to her lymph nodes and metastasized in her liver. 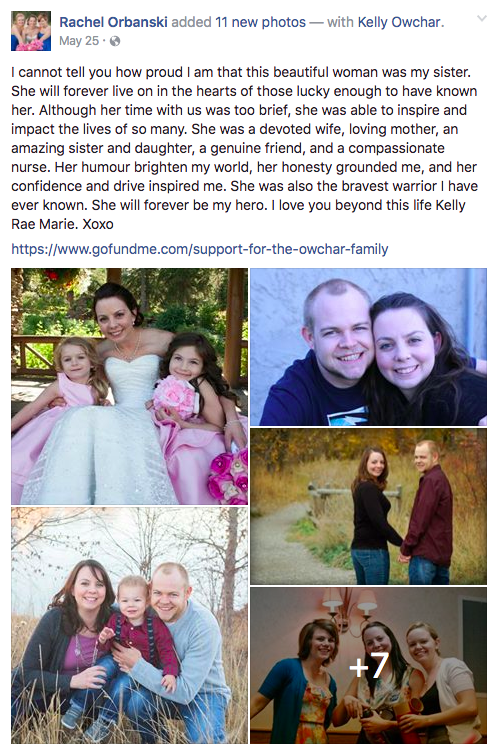 Just one week after her diagnosis, on Monday, May 22nd, 2017, Kelly passed away. 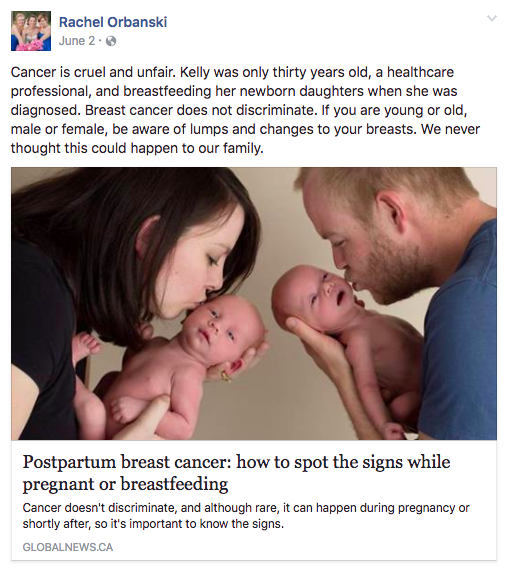 Kelly’s sister, Rachel Orbanski, says it was “terrifying and devastating in how quickly it went through her body.” Since her sister’s death, Rachel has been memorializing her on Facebook and spreading the word about the symptoms of breast cancer, which can sometimes be hard to spot, especially while pregnant or breastfeeding. Dr. May Lynn Quan, the medical director of the Calgary Breast Health Program, says blocked milk ducts are generally painful and tend to fluctuate in size depending on how long its been since the last breastfeeding. If a lump in the breast is painless and doesn’t get bigger and smaller, it should be concerning. Kelly’s story is a sad one, but it also has the potential to save the lives of countless women who would otherwise miss the signs of breast cancer because of pregnancy or nursing. Natural changes in the breasts and the rest of the body during that phase of life leads women (even nurses) to believe their symptoms are not anything to be worried about. In reality, it’s always best to check with your doctor if you’re not sure about something new that’s happening to your body. Rest in peace, Kelly. May your life be an inspiration to us all and a valuable lesson to many.